Gervaise, a 1956 film set in 19th century Paris is based on the Zola masterpiece L’Assommoir. The film’s main character is Gervaise Macquart (Maria Schell), a beautiful, blonde laundress whose wholesome youth and beauty is marred by a slight limp. When the film begins, Gervaise lives in a dingy room with her lover Lantier (Armand Mestral) and their two young sons. Even though they are not married, Gervaise calls herself Lantier’s wife unaware of the ridicule that this brings her behind her back. Lantier, it seems, is in the throes of an affair with a neighbour. Everyone in the Parisian slum knows about it, and the news forms a sort of gossipy thrill which explodes into titillating entertainment one day when Gerviase fights with the other woman’s sister, Virginie (Suzy Delair). This incident has long-term ramifications for Gervaise. Eventually Gervaise moves on from her grief at losing Lantier and she meets and marries affable roofer Coupeau (Francois Perier). At first Gervaise thrives in her marriage to Coupeau. They have a child together, Nana (Françoise Hery) and Gervaise has a goal of managing her own laundry. This dream is put on hold temporarily when Coupeau has an accident that takes away his ability to earn a living, but long-term, devoted friend Goujet (Jacques Harden) lends Gervaise the money, and she goes into business for herself. Gervaise’s troubles begin, although it takes her a long time to realize it, when Coupeau has his accident. Then the arrival of Virginie and the parasitic Lantier seals Gervaise’s fate. The film, while good entertainment, unfortunately, falls short of Zola’s marvelous novel, L’Assommoir. In all fairness, I don’t think a film format (just under two hours) is the right setting for the novel. This needs to be a miniseries. Before watching the film, I was curious to see just how a film in the 50s would cope with some of the more salacious details of the novel–Gervaise’s peculiar domestic arrangement with Lantier and Coupeau, for example. The film chooses to gloss over much of this savage degradation and only lightly touches on the subject. Interestingly the film glosses over most of the book’s savagery: the viciousness of Gervaise’s former friends and neighbours, Gervaise’s slide into alcoholism (it’s touched on in the film) and her eventual wish for the oblivion of death. 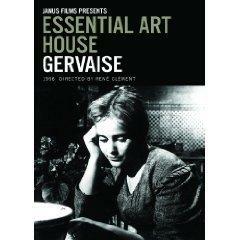 The film simplifies while avoiding the highly detailed feeding frenzy that takes place over Gervaise’s body and her ability to work–whereas the novel is wrenching in parts as it describes Gervaise’s gradual slide into degradation and oblivion. The film from director Rene Clement tries to maintain a sense of faithfulness to the novel–it includes the wedding scene, for example, and Gervaise’s grand dinner for her ungrateful neighbours. But when it comes to showing the details of the viciousness of life among the working class, the film falls short. Perhaps it was considered too depressing to create a film that went into some much detail of the moral depravity and cruelty of its subjects–although the film does show in a couple of scenes how naughty Nana became while still just a wee tot. The film rather interestingly also accentuates the way that Lantier and Coupeau are somewhat similar types, but by glossing over the more sordid, savage aspects of the novel, the story loses its grandeur and becomes more of an average love story. What we need is a BBC miniseries or a French television miniseries to do Zola’s masterpiece justice.